This blog is a repost from the GPS Innovation Alliance. Thanks to legislation passed by Congress in 2012 that established FirstNet as an independent authority within the U.S. Department of Commerce, preparations for a nationwide, interoperable public safety communications network are well underway. Touted among the many benefits for first responders include access to broadband-enabled devices, interoperability with neighboring jurisdictions and critical connectivity for rural communities. First responders in the field also stand to gain another valuable benefit: improved situational awareness and tracking using Global Positioning System or GPS. Yes, the same GPS technology that enables location-based navigation services on our mobile devices can be a gamechanger for first responders and FirstNet can make this a reality without adding additional user costs. First, some basic history on how GPS became what it is today: a critical public resource that is used in nearly every sector of our economy. Launched by the U.S. Air Force in 1978, GPS was originally designed primarily for our armed forces. In the years that followed, as additional satellites were launched (there are currently 31 active satellites in the GPS constellation), GPS evolved into a tool with the reliability and accuracy to support core aspects of our nation’s critical infrastructure including financial services, energy, communications and transportation. GPS is also no stranger to the public safety community. In the late 1990s, as mobile phones became more ubiquitous, the Federal Communications Commission (FCC) rightfully recognized that unlike landline phones which are tied to a physical address, mobile phones can connect wherever there is wireless coverage. Recognizing the challenge of locating wireless 911 calls, by 2001, the FCC began implementing a requirement that wireless providers be able to relay the latitude and longitude of a caller to a 911 call center. Handset-based GPS would become among the key technologies used to acquire this location information. The FCC updated its location accuracy requirements in 2015, recognizing that technologies such as “Assisted GPS” offered opportunities for even greater improvements in location accuracy. And just this summer, Apple announced that its next software update will automatically make device-based location information available through its integration partner(s) (only one has been announced to date) to 911 centers when a person calls 911, thanks to a suite of technologies including Wi-Fi, cellular towers and GPS. Thanks to the widespread use of GPS-enabled smartphones, today first responders have a host of new tools at their disposal. Recently I learned about PulsePoint, a San Francisco based non-profit foundation that has developed a mobile app to alert nearby CPR-trained users during the crucial first minutes of a sudden cardiac arrest. This promising technology can be particularly important in rural communities where the nearest EMT may be more than 10 minutes away, and a CPR-trained citizen is alerted to a medical emergency happening a mere 500 feet away. 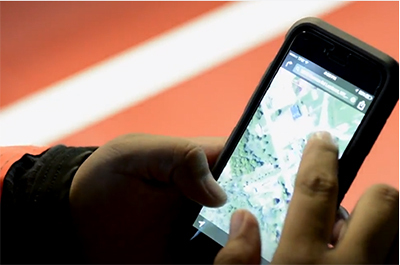 Using GPS, PulsePoint’s mobile app can make this connection and has in fact been activated more than 51,000 times. Now as first responders begin to take advantage of FirstNet in communities nationwide, we have a new opportunity for GPS-enabled devices to help save lives. GPS-enabled devices can improve situational awareness for firefighters battling a large-scale fire. Tackling a large wildfire, for example, requires that firefighters be strategically positioned with real-time information about their locations relative to the fire. GPS-enabled devices can give that incident commander coordinating personnel the precise location information needed to effectively fight the fire. For law enforcement, knowing exactly where assets and personnel are located while securing a large event is invaluable. When a call for help comes in, commanders can easily and quickly locate and dispatch the closest first responder using GPS-based apps with FirstNet. This saves precise time when seconds matter most. EMS can also benefit from GPS technology over FirstNet’s dedicated network by using mapping tools to automatically find the faster route to the hospital. Or during a mass causality event, GPS can be used to monitor the location of ambulances in conjunction with a patient tracking system for a better understanding of the event and more efficient response. And imagine if precise location information provided by a 911 caller’s wireless device could be seamlessly transmitted from a call center to first responders on the ground? Great strides are being made to enable this ability on consumer devices and through NG 911. And for first responders who are equipped with broadband-enabled LTE devices, certified by FirstNet, they will be ahead of the curve as this technology becomes a reality. In syncing this location information together with appropriate privacy safeguards, we can improve response times and more efficiently route first responders to their next call. As the trade group representing the GPS industry, we are proud of the role that GPS technology plays for first responders and are committed to working with the public safety community to ensure they have the location-based tools necessary to save lives.